Utopian: This is Now Getting Serious!steemCreated with Sketch. Utopian.io is the only platform rewarding Open Source contributors and it's doing it with Steem! In this post I am going to show you the latest updates made on the platform and how to be rewarded for contributing. If you have visited Utopian.io before please refresh the site few times to clean the cache of your browser until the new changes show up. 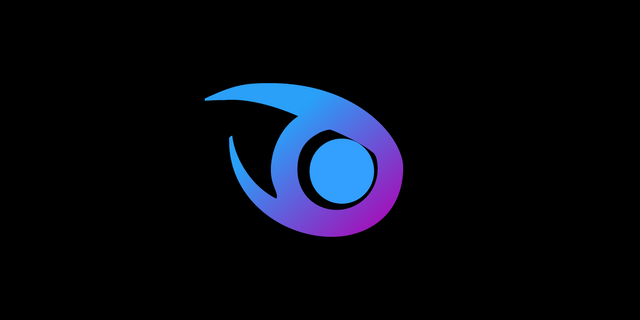 Utopian.io enables everyone to contribute to Open Source projects by providing Ideas, Code contributions, Graphics or Social exposure and be rewarded for that with Steem. A project is Open Source when its codebase is public. Steem is Open Source, WordPress is Open Source and there are so many other Open Source projects out there. Most if not all of the Open Source projects are hosted on Github.com. Utopian offers a full integration with Github, allowing you to link your contribution posted on Utopian with an Open Source project hosted on Github. The most important update is going to be the Utopian Weekly. The Utopian Weekly is a newsletter about the best Open Source projects around Steem and in general the most ground-breaking Open Source initiatives. The Utopian Weekly will be published under the official Utopian account: https://steemit.com/@utopian-io. Go there and follow @utopian-io. The newsletter will be 100% Powered Up. The author rewards will be used to upvote the best contributions on the platform. If the point is to fund development why give the reward back to those who gave it?. That's why I decided that Utopian is going to fund itself by providing quality contents every week and use the author rewards to upvote the best contributions posted on the platform. Utopian does not want to attract users looking for easy returns. Utopian wants to grow a community where people actually collaborate and use their power to upvote other contributions. Simplicity. There is really too much to say about STEEM, STEEM Power and STEEM Dollars and for new-comers they are really hard to understand. Utopian has only one and that's STEEM Power. Users who want to power down and liquidate their STEEM Power can still do it via the Steemit wallet, but Utopian does not know anything about that and will not encourage the users to do so. The Begin of the Next Big Thing! Utopian now provides a way to categorise contributions. This change is important to let the users understand the platform better and enhance the quality of the contributions. Idea/Feature: This is the most important category. 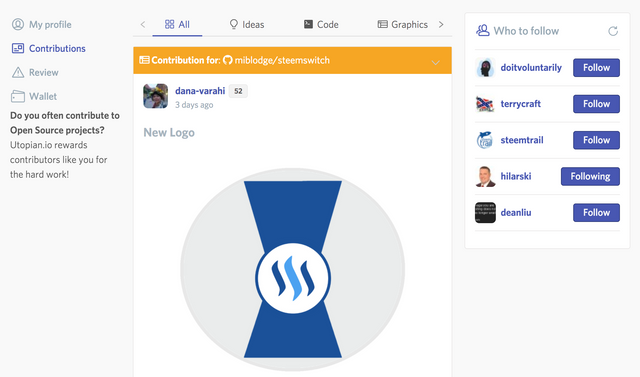 Soon Utopian will provide a way to fund ideas with Steem. Funds will be then split between all the contributors, meritocratically, based on the upvotes received on their contributions for the idea/feature. Graphics: Graphic design, layouts, logos and any other kind of graphic contribution. Social: Spreading the word about the Open Source project with social networks and similar tools. Thanks to this categorisation all the contributions can now be filtered based on their category in the Utopian homepage and on the Project page. Utopian has now implemented a review system. When creating a new contribution it will go to the blockchain but won't appear in the Utopian feed until a Steemit/Utopian community member with at least 55 points of reputation will verify it. Few posts have been added to the Utopian feed recently of a really low quality or spammy. Utopian is the place for contributing to Open Source projects, not for sharing stupid contents. The review system wants to enable collaboration between the Utopian members. This is why even if you have a reputation equal or higher than 55 you won't be able to review your own contribution but another user with reputation equal or higher than 55 will do that. Instead you can verify contributions made by others and allow them in the Utopian feed if they meet the standards. If a contribution does not meet the Utopian Standars, users can advise changes to the owner of the contribution using the comments. This is where collaboration becomes a fundamental part of the platform. 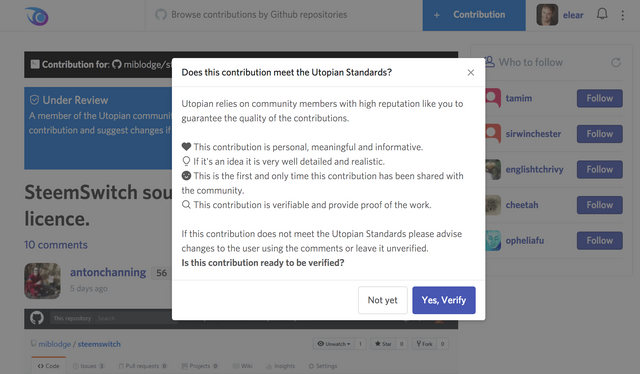 Contributions not yet reviewed are still visible by everyone, under https://utopian.io/all/review but only users with reputation equal or higher than 55 will be able to verify them and allow them to appear in the main Utopian feed and to be voted on Utopian. For now I am personally reviewing any new contribution and providing help to early adopters. Thanks to @yabapmatt and @codewithcheese for having brought this to my attention. Tags were removed from Utopian because they were necessary to filter out the contributions. The system has completely changed now and tags are allowed, up to 4, when writing or editing a contribution. The default main category still is 'utopian-io' and all the Utopian posts will fall under this one. Thanks to @antonchanning for this one. Now a link to the project related to the contribution is shown on top of the contribution details. Thanks to @gotgame and @codewithcheese for reporting some issues with the Github field. Now you can paste the Github repository URL directly or still search by repository name. Just some healthy UX improvements. A way to fund ideas. This is going to be a ground-breaking change. Utopian will allow everyone to propose new ideas. Members can fund ideas and the funds will be shared with all the contributors who have contributed to make the idea a reality, meritocratically, based on the number of upvotes received. The begin of a new, shared and meritocratic economy. Mass adoption. As many of you know Utopian was originally based on the new frontend (not yet released) of Busy.org. The guys from Busy.org gave me a lot of support and motivation. A special thanks goes to @fabien and @ekitcho. I am always following their updates since they are working on few incredible features to make the adoption of Steem easier. Utopian is already integrating the most secure authentication service SteemConnect V2 provided by them and supported by Steemit. More integrations of their tools will also be soon implemented in Utopian. I am also working on a landing page, on an emotional video and better wording to make the platform understandable and adoptable also by new-comers. More specific features based on the contribution type, such as a way to directly link Github pull requests, branches, etc. Thank You @elear I will take some time this weekend to fully read your post and take the time to research and understand what utopian is doing to expand on what we have with STEEMIT. You are more than welcome to do so @stokjockey! This is wonderful @elear, it's great that Utopian can now be used to fund ideas for the open source world, it's going to be a great source of encouragement for developers who want to work for betterment and development of the steem platform and other related projects. Thank you so much @gotgame!!! Another feature I would like to see in the future, is the ability to set up 'beneficiaries'. Chainbb takes advantage of this feature in steem and allows a poster to add multiple beneficiaries to a post, each allocated a specified percentage of the total reward. In collaborative open source projects this might allow a team to have a few people concentrate on coding, whilst another makes the utopian posts, yet all get rewarded (as they agreed with each other). @antonchanning this is actually an amazing idea! Thank you @inquiringtimes and congratulations for your ticket to the SteemFest! Upvoted & Following you. I'm looking forward to seeing what your platform does. Oh boy ! Unfortunately, I'm not a developper but... wahou ! it's incredible. Thx. Your work is very important. Thx, I'll survey what kind of contribution has made on the platform. I'm sure that utopian.io will be a big success. That does not seem right to me! Thank you so much for the proposal @simnrodrguez. Utopian at the moment is only in english but you are more than welcome to share your contributions to other Open Source projects using Utopian! Thanks @transisto @codewithcheese @antonchanning @gotgame @ekitcho @fabien @yabapmatt for your support. Congratulations @elear, this post is the forth most rewarded post (based on pending payouts) in the last 12 hours written by a Superuser account holder (accounts that hold between 1 and 10 Mega Vests). The total number of posts by Superuser account holders during this period was 619 and the total pending payments to posts in this category was $2890.47. To see the full list of highest paid posts across all accounts categories, click here. A wonderful post. @elear followed. I'll be sharing this when opportunity rises. Great work! Thank you @igster. Utopian got 400K in delegation so it is quite big thing already! Wow, good to see such a huge support. This project deserves it. I'll be following your progress with great interest. The community owes you a big time @elear & your team members. I, Thank you on behalf of all the community members for Incentivizing the Open source Economy. Happy Utopian !! 😇 Utopian itself means aiming for a state in which everything is perfect & we wish you brazen luck for the same. The @OriginalWorks bot has determined this post by @elear to be original material and upvoted it!